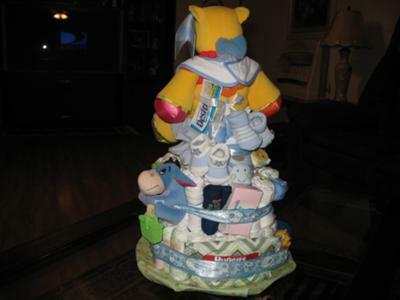 What a fun diaper cake! Sharon shared her cute cake and her helpful directions. Thanks so much for your creativity, Sharon! This is how it was made: Cover your base with whatever your'egoing to use. Center bank in center of pan. First tier, inner layer was done with diapers. Second layer wash cloths. Outer layer diapers(secure each layer with rubber bands) *make sure each item is the same length & secure each item with small rubber band. Second tier, inner layer was done with wash cloths, second layer onsies, t-shirts, & diapers if needed to fill in space. My topper was a winnie-the-pooh stuff animal(theme of baby shower). Cover rubber bands on each tier with wide ribbon. Once all together start stuffing items into cake. Ex. pacifiers, comb & brush, socks, booties, small stuffed animals, trial size bath items. I used a bottle cleaner to secure stuffed animal on top. This was made for my niece and her first baby. I hope she likes it. Your cake helped me a lot in getting ready for my sister's baby shower.